"The brief was to design a preschool on this small footprint of land, but the developer said the building might need to be used for other things in the future, so I had to design it in a way that it could be easily repurposed…With these constraints, Saul worked with a changing preschool committee over the life of the project. Yet the building doesn’t have the look of something built by committee or by competing interests. It holds together, with a feel of honesty and substance to the materials and the design.“From the very start, I had a great clients…. we looked at the environment the kids were coming from – which was a beautiful old chapel school – and we said to ourselves it would be a crime to take them from that and put them in something with a lot of plasterboard, you know? So often society talks about how important children (and the elderly) are but somehow they always end up in low grade environments. We wanted to change that.“It would have been a disaster to take them from a textured, handcrafted environment to something really boring. So we thought, let’s take some things across.“Some people think that kids aren’t going to tell the difference, but they do. My little boy is the one pulling on my leg and showing me caterpillars – they notice all those little things.The idea of a building inspired by something children could relate to – a toy-like timber meccano structure and large concrete building blocks – faced with natural stone facades felt right. 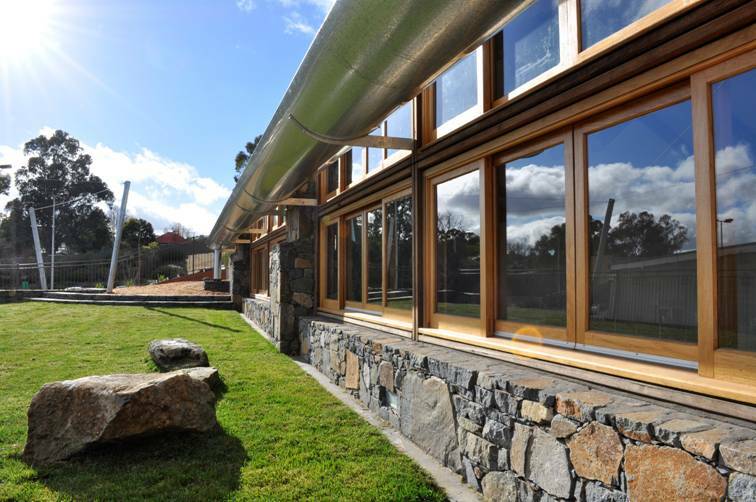 The timber in the frame, doors and windows adds warmth and texture, as does the stone facia on the exterior, and one interior wall.“The stone is from a local quarry in Murrumbateman. It was fascinating to watch the stonemason work, painstakingly cutting each piece.” “We wanted to make all the textures honest,” Saul adds. “Schooling should be about honesty and showing something of the truth of things.“The trusses are my favourite part,” Saul says with enthusiasm. “They’re like giant toys, but based on something called ‘tensegrity’ – balance of push and pull. It’s a perfect expression of the forces that are going on within a truss. The steel is pulled, providing tension, and the timber is being pushed or compressed. If it wasn’t for that balance , the trusses would collapse like a pair of scissors.”Saul has a plan to one day make working models of the roof trusses using rubber bands for the preschool children, so they can experience how it works.…The concrete floor is heated hydronically. 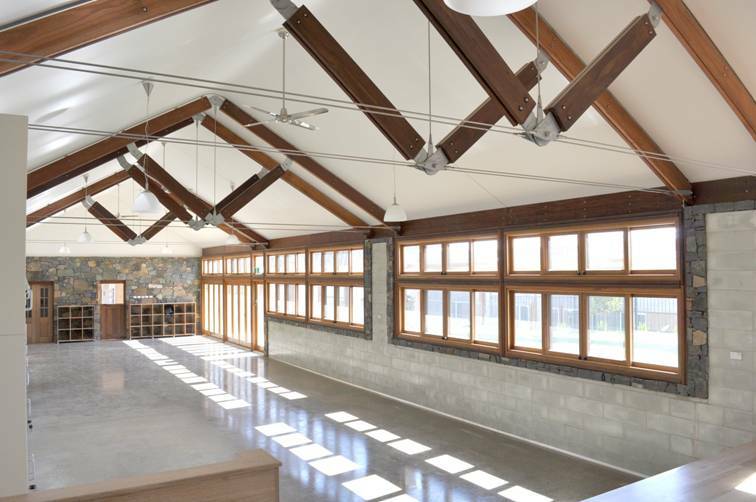 Winter sunlight pours in through the wall of timber-framed windows, while the fierce summer heat is cleverly blocked by the eaves and a large dish gutter which runs along the northern face of the building.